Hello there. I'm totally failing as a travel blogger, but in my defense, I've been pretty busy... traveling. 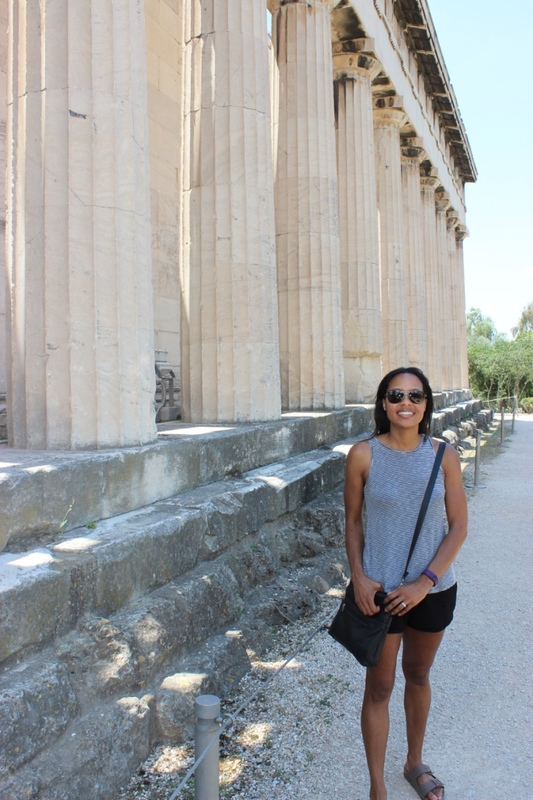 We had five days between coming back from Paris, and leaving for Athens. 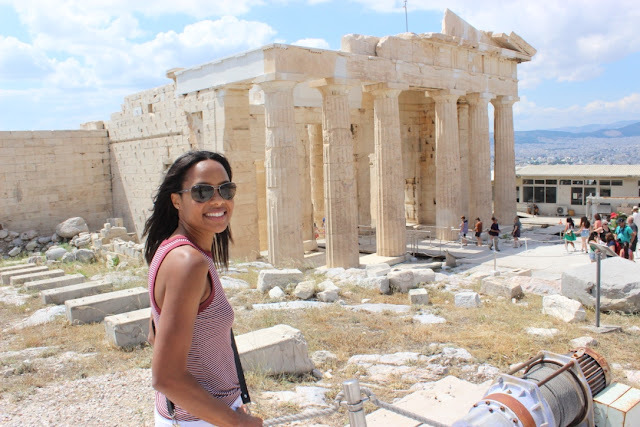 Athens, Greece was basically a pit stop on the way to Santorini. 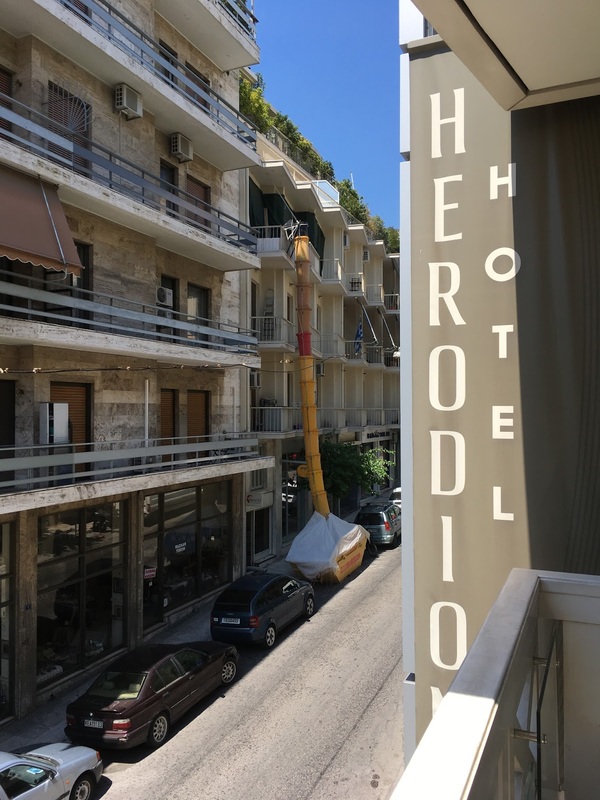 We were going to be down there and Santorini is too expensive to stay for an entire week so we added a few nights in Athens onto our itinerary. We didn't make any plans for Athens. Amid all the trip planning that we were doing we didn't even schedule our transportation from the airport to the hotel. I figured we could take public transportation, but our flight didn't land until close to midnight. We would be too exhausted to deal with it so I booked Welcome Pick Ups the day before we left. It was more expensive because of the late night pick up, but it was nice to get straight to our hotel as quickly as possible. Our driver was right there with my name on a sign when we came out. There were actually so many drivers with signs we could barely find him. From what I gather it's kind of like Uber, but only open to drivers with a professional license or taxi service and they aren't available in a ton of cities. They get a guaranteed fare and we get a flat fee. Win win for everyone. He talked about some of the history of Athens on our way there, answered any questions we had, and offered us each a bottle of water. 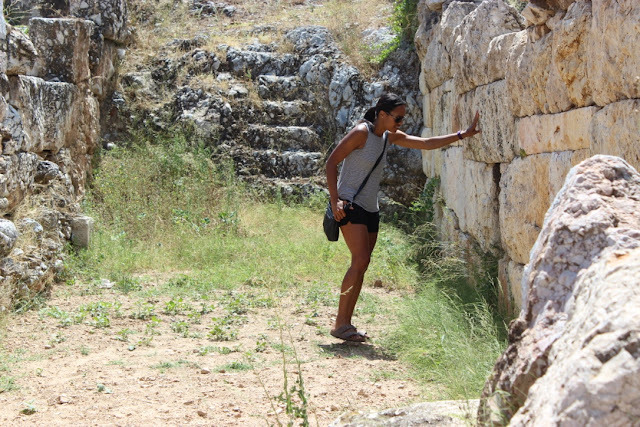 We also had the option of buying Acropolis tickets or booking a tour with him. It was really weird when we got to the hotel. It was dark, quiet, and empty. There were two men at reception waiting for us. One of them walked us to our room, which was nice. It turns out that they just want to conserve electricity. 'Aint nothin' wrong with that. You have to leave one of the key cards in the wall or else the power shuts off and we found that to be the case in our Santorini hotel also. I was kind of nervous as we walked through the dim hallway, but the room was fine. Small (but not as small as Paris) and basic. There was no shelving or drawers, but there was a closet. The bathroom was tiny, but modern and clean. Overall, it was perfect for our needs, because what you are paying for at the Herodian Hotel is location, location, location. We were steps from the Acropolis, now we just had to figure out how to get our tickets. I'd checked out the website before we left, but it was confusing, and I had other things to do so I gave up. It seems like you had to choose a time in advance which I hate having to do because I don't want to commit, and I couldn't figure out which tickets I was supposed to be buying. There were two sets, and it wasn't clear what that would get me. Also, it was just the museum. What about the Acropolis? The next morning I looked again. It's the thing to do, so we had to get tickets and I didn't want to spend a lot of time waiting in line. This website explained everything. The Acropolis alone is €20 so we paid the €30 for a multi ticket for Acropolis, Parthenon, and other archaeological sites. Neither ticket can be purchased online. It was good for five days and we could buy it at any location. We ended up buying it at Hadrian's Library where there was no line, and went straight to lunch because we were starving. I didn't notice it until after, but the lady who sold me the ticket tore off the Hadrian's Library ticket, so we never actually got to see that one. We started with the Acropolis first, which is definitely the highlight. There is a lot to see there, you just have to be careful not to slip on the marble. It's everywhere throughout that area and very slippery even in tennis shoes. After the Acropolis we began making our way to the other sites that were part of our ticket. Athens is a charming city, and I really liked getting to walk through it as we went from site to site. That night we ate dinner at Point, the rooftop restaurant of our hotel. 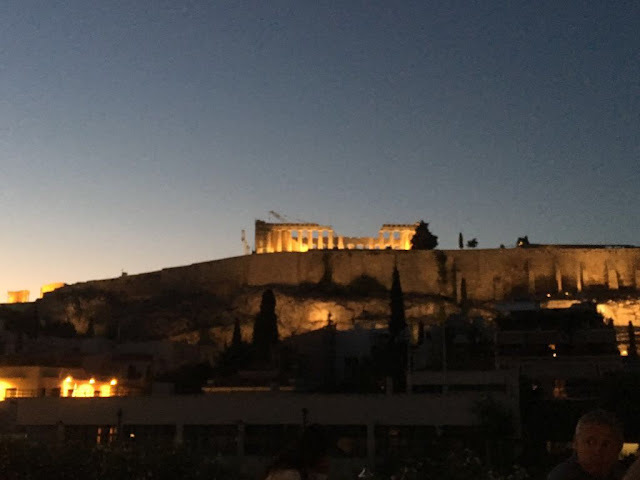 It was pretty windy, but the food was good, and the night time view of the acropolis was unbeatable. On day two we started with the Acropolis Museum. It isn't covered in our multi ticket, but it was only €5. There were a few cool structures on the other sites but a lot of them, but after a while your realize that you are basically looking at piles of rocks. It was so hot with the sun beating down on us that by the end of the day we were sweaty and exhausted. We finally called it quits with about three sites unseen. MJ wasn't really that interested in seeing the first Olympic Stadium, but he would have gone. I was just too hot and tired, so we went back to our hotel room, took showers, and napped. 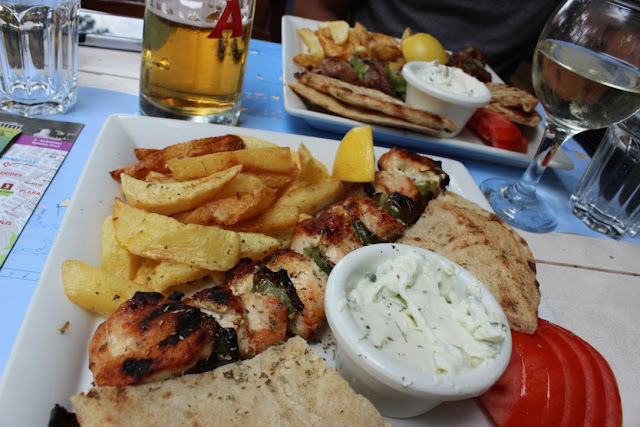 That night we went to a local non touristy Greek restaurant near our hotel for dinner. We literally sat in the street, because that's where they found room to set up a small table for us so we could sit outside, and we enjoyed our last night dining among the locals. One of which was a table full of smoking women. Ugh. We hate cigarette smoke, but when in Europe that is to be expected. Because we got to Athens so late on day 1 and had to get off to our next flight on day 4 we were there for three nights, but really only had 2 days for exploration. Not ideal, but sometimes that's how it turns out. I was getting ready to book Welcome Pick Up to the airport, but decided to check the Uber app and it turns out Athens is the only European city my well traveled husband has encountered that has it. Our driver picked us up in a timely manner and we were off to our next destination. I'm pretty sure there are things we missed out on. 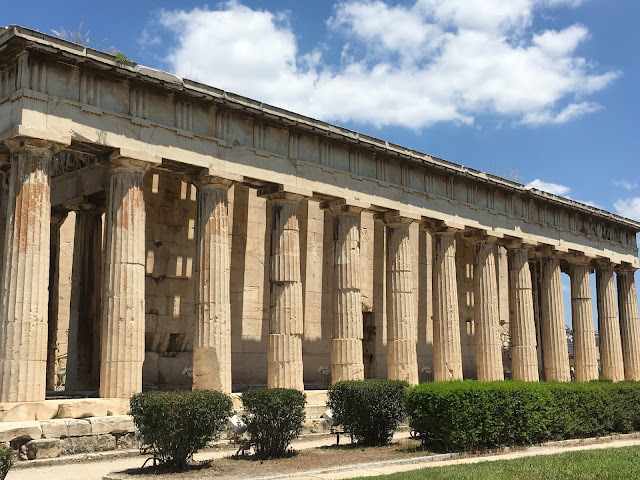 We really didn't do any research for Athens and clearly weren't too concerned since we didn't have that much time there and it was kind of a side trip anyway. 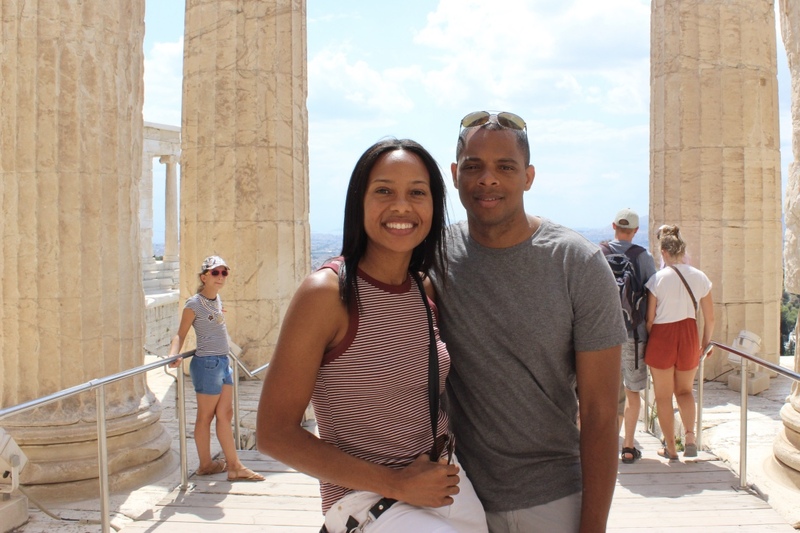 Overall we enjoyed Athens and I'm glad we got to go. The more I get to see of the world, the merrier. There was a bit of a snafu with my airline ticket at the airport on the way back. MJ auto filled my name on the ticket. Only problem is it was my maiden name! My passport has my married name of course, so the ticket agent asked me if I had anything with my maiden name that I could show her. Thank goodness my marriage license is saved in dropbox, and I was able to access it from my phone. I'm really not sure what we would have done otherwise. It was imperative not only that I get out of Athens, but that I get to Santorini. Serious trip of a lifetime. It has been amazing following along on your Instagram and instastories! You have me itching to go to so many places now! Cece, I think you should become a travel consultant on the side!